Every handbag lover has fantasized about creating their very own perfected designer bag. Imagine if you could pick the style, materials, colors and lining of your dream bag all for under $1000. It's a fantastic idea and thanks to Design Guru, you can make this dream a reality. The concept of Design Guru is ..."to enable personal expression and encourage personal growth". So how do they actually achieve this mission? It's simple. They let you unleash your creative juices while they do all the work. YOU become the handbag designer and can create your own custom made bag. This smart website walks you through the process of creating your bag very carefully. First you choose a style from the selections they offer. The designs are simple and range from a casual tote to upbeat shoulder bags and a very classic top handle bag. The next step is to select the color or colors you'd like to see on your bag. The color palette is pretty standard but there are a few choices that will provide you with some individuality. All that's left to do is pick the interior lining as well as the symbol (optional) you'd like to have on the lining. These symbols (the lotus flower, sun, star and love bird & heart) are another way of personalizing your bag and are meant to be reminders of your daily intentions in life. I'm not too keen on the symbols, but if they appeal to you then they can't hurt the look of the bag since the symbol is only visible by opening the bag. I used the customization feature to create my favorite versions of their designs (pictured above). The site offers ready made versions of their 'Stadia' design which are all gorgeous and take the guess work (as well as the fun) out of the process. If you're not in the mood to exercise your brain, the pre-made selections will not disappoint. 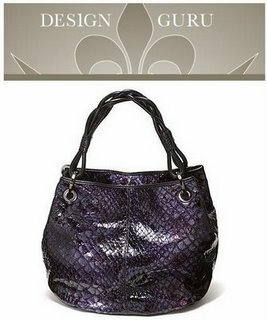 Browse the Design Guru site and tap into the handbag designer that lies within you.